Keeping a highly available web application online is no joke. 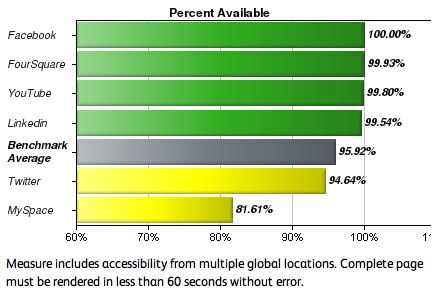 Everything above 99% is extremely impressive; that means that you battled the forces of erosion and probably even deployed some pretty neat features without even a hiccup from your users’ perspective. I always feel great when I get our weekly New Relic status report email – it’s a good indication of how well I did my job in the previous week. And for a couple weeks now I’m happy to report I’ve been very proud indeed, with 100% uptime on the Hipstamatic web application. How do you achieve numbers like these? Unfortunately getting to 100% isn’t an easy road, and I want to state up front that I also don’t think it’s a realistic goal. Issues you can’t control can ruin your uptime number, and you shouldn’t feel broken up about that. It happens to everybody. But it’s always good setting goals that are difficult to achieve, and this one is no different. So what’s the secret to 100% uptime? Some people check their fantasy baseball league or their portfolio every morning. At the slightest hint of trouble, they’ll be waist-deep in trading players or stocks to get everything right back on track. You should be that way with your servers and the software that runs on them. This usually means monitoring software, and a lot of it. if totalmem > 90% for 6 cycles then exec "kill -USR2 `cat /pids/unicorn.pid`"
if cpu > 90% for 6 cycles then exec "kill -USR2 `cat /pids/unicorn.pid`"
This states that I get an alert when unicorn’s total memory or CPU usage exceeds 70%, and that unicorn receives a USR2 signal when total memory or CPU exceed 90%. Finally, we employ munin to compile statistics that we care about, including nginx connections and unicorn requests served. Yes, this is a lot of monitoring. But I feel like even this isn’t enough. You can’t watch your stack too carefully, and you can’t have too many tools in place to help you analyze what’s going on. Consider this trifecta of tools only a start, but at least it’s a good one. On an average week I deploy seven to ten times. Of course, this entire process is invisible to our users; the magic that makes this happen is unicorn. There have been many posts on the wonders of unicorn and how to configure it correctly. I will simply post the part of our unicorn.rb that allows us to do seamless restarting, which you can find in a number of gists essentially unmodified. USR2 is the signal that tells unicorn to start reloading itself: the before_fork causes the new server to kill the old server only when it’s ready to start processing connections. Frequently we are required to change existing tables and colums or add new ones. For those of us still using relational databases, migrations almost always mean locked tables, and locked tables mean site downtime. To fix this problem, my tool of choice has been Large Hadron Migrator. Large Hadron Migrator requires very little from your tables (just an autoincrementing ID) and allows you to alter tables and even add new columns without bringing your site down. Yes, unfortunately, this includes raw SQL. There is a small DSL that exposes a few common methods, but for anything really deep you’re gonna need to get your hands dirty. Using this method you’ll be able to become the envy of your friends and peers, for you’ll be able to execute zero downtime migrations. And imagine that your website and a 100% bar are sitting right at the very tippy top.